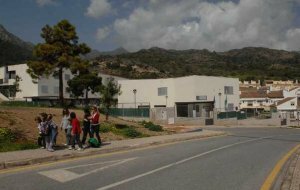 Marbella, Andalucía clash over land for schools | Marbella Marbella – Adelante! A new school in the north of Marbella would help aleviate the school shortage in the city. The dispute between the city of Marbella and the government of Andalucía over the construction of new schools within the municipality continues. The disagreement arises from issues over land usage. Land that the Andalucía Ministry of Education has proposed is under examination to determine whether previous zoning laws would restrict land use, particularly for a school. The Málaga Provincial Board of Education, acting with Marbella, say they are not satisfied with Andalucía’s proposal, and that such proposals must be supported by documents proving their legal status of the land. The Andalucía Ministry of Education has alleged that the Marbella city council and the Málaga Provincial Board of Education are not acting quickly enough to ameliorate the shortage of schools in the city. The regional administration has warned the Marbella consistory that it has not satisfied requests for the transfer of land to build more schools. The Andalucía government further claims that the land it has proposed for schools is legal and safe, with no risk of legal action in the future after the proposed schools are completed. Sources from the Provincial Board of Education, however, say they are merely being cautious. They say the proposed parcel of land, a 13,000 square-foot property on the northern edge of the city, was designated as park land under the General Urban Plan of 1986. They also repeat that when undertaking any action in Marbella, the Andalucía Ministry of Education cannot ignore legal issues of land ownership resulting from the urban planning policies of the late Mayor Jesús Gil. On Wednesday, April 21, a city council delegation headed by the Head of Service Planning, Marcelo Gaitan, visited the proposed site along with the Councillor for Education, Carmen Diaz, and the delegate of Works, Javier García, and others. The disagreement runs deeper than that, however. The sources in the Provincial Board of Education also argue that before it can approve land for school use, the land must be conditioned, and the neighbourhood in which it is located must be urbanised. These sources say they are trying to be clear so that they do not repeat last year’s dispute, when the Provincial Board refused a 70,000 square-metre parcel offered by the City because it was deemed unsuitable for a school. The new General Urban Plan, which itself is facing delays in being implemented, includes a total of 250,000 square feet for educational facilities. However, The Marbella city council and Provincial Board have not resumed negotiations on where to place new school or how to alleviate the overcrowding of existing ones. Sources say there is no harmony between the two authorities – the Marbella city council and the Provincial Board of Education on one hand, the Andalucía Ministry of Education on the other. There is only a difference of opinion and approach. ‘There are no guarantees for the moment’, the sources say. There is yet another perspective on the issues of Marbella schools, however – Marbella City Hall. The head of Marbella Town Planning, Pablo Moro, criticises the Provincial Board for moving so slowly on what he says is a very important problem. Moro notes that ‘in principle’ the ground is already under municipal ownership. He agreed that legal documentation should be examined, but he also urged the board to accept Andalucía’s proposal so long as it ‘meets all the conditions’. ‘What is clear is that the Board has no excuse not to build schools in Marbella’, said Moro, lamenting that the the city council team visiting the proposed parcel on Wednesday raised issues such as high-voltage cables or possible environmental problems, rather than considering the land for its potential in easing the school shortage. For its part, the Board of Education said Wednesday that the visit was the starting point for negotiation and that technicians of the Board and City Council are already working on finding the best solution.